The Obama administration and congressional Democrats are making a new push to raise the minimum wage to $12 an hour by 2020. Top Democrats are getting behind the Raise the Wage Act introduced Thursday, which they say would increase the federal minimum wage for nearly 38 million workers. The push goes beyond a previous proposal to lift the wage to $10.10 over three years. That effort, championed by then-Sen. Tom Harkin (D-Iowa) in the last Congress, stalled amid fierce opposition from Republicans. But Democrats say they are resolved to keep pressing for an increase, even now that the GOP controls both chambers of Congress. “Let’s make sure hard work pays off,” said Sen. Patty Murray (D-Wash.), a sponsor of the bill. Labor Secretary Tom Perez, Senate Minority Leader Harry Reid (D-Nev.) and House Minority Leader Nancy Pelosi (D-Calif.) are also putting their weight behind the effort to raise the minimum wage. The lawmakers held a press conference Thursday afternoon to introduce the bill. Raising the minimum wage would be “so terrific,” Reid said. “This is about Americans aspiring to the middle class, helping them get there,” Pelosi added. 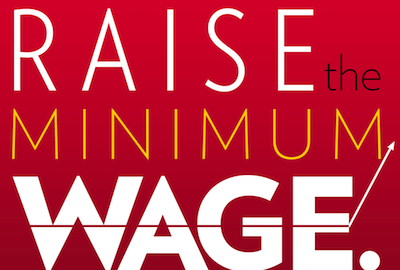 The federal minimum wage is currently $7.25 an hour; it hasn’t been raised since 2009. The Raise the Wage Act would initially raise the minimum wage to $8 an hour [it is currently $8.05 hour in Arizona], followed by $1-increases each year after that until it reaches $12 in 2020. The legislation would also phase out an exemption for restaurants and other companies that allows them to pay tipped workers less than the minimum wage. President Obama is “enthusiastic” about raising the minimum wage, Perez said. The organization Raise The Minimum Wage calculates that the minimum wage in 1968, adjusted for inflation, would be $10.90 per hour today. That is $2.85 hour more than Arizona’s statutory minimum wage. (Inflation adjusted is not the same as a COLA adjustment, which would be even higher). In either case, Arizona’s statutory minimum wage currently is too low. The “Raise the Minimum Wage for Working Arizonans Act”, Prop. 202 (2006), allows the Arizona legislature to raise the minimum wage over and above the amount called for in this law. Yeah, that’s never going to happen with our current Tea-Publican Arizona legislature. It will have to be done by another citizens initiative to correct the basis amount, either adjusted to restore the peak buying power of the minimum wage in 1968 to what the annual cost of living adjustment (COLA) would make it today, consistent with the remainder of the law, or pick any basis amount that appears to be politically viable, as Fight for $15 has done. Of course, none of this would be necessary if the federal government would simply do as Arizona citizens did in 2006: raise the minimum wage to $15 hour, for example, and include the automatic annual cost of living adjustment (COLA) so that Congress can no longer hold the minimum wage hostage to partisan politics. If Congress can finally agree to resolve the “doc fix,” it sure as hell can end its political gamesmanship over the minimum wage. Does this bill include an automatic COLA?